It is finally here! 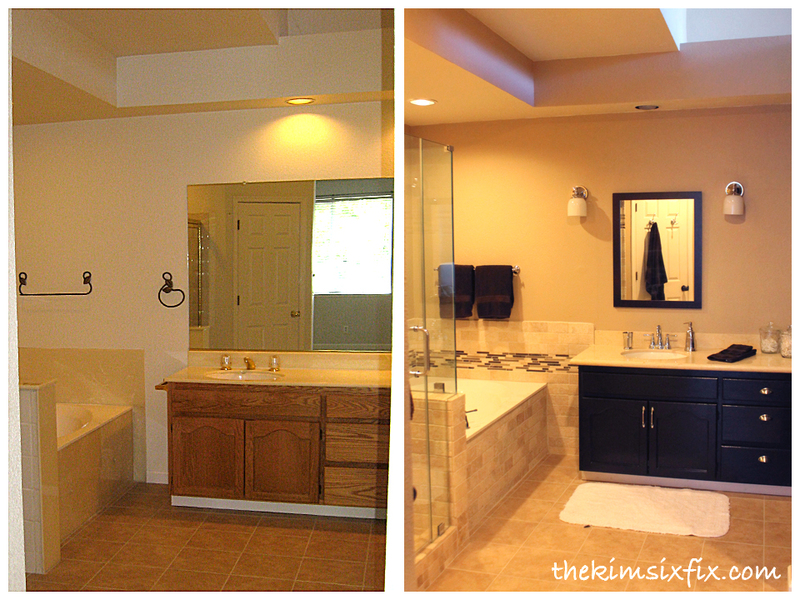 The day I share with you my finished master bathroom renovation! This is the largest project I have ever tackled on my own, and I am really proud of it. It only took about 6 months and a little more than $5000 but I did it! Single-handedly and while pregnant, I renovated my bathroom. 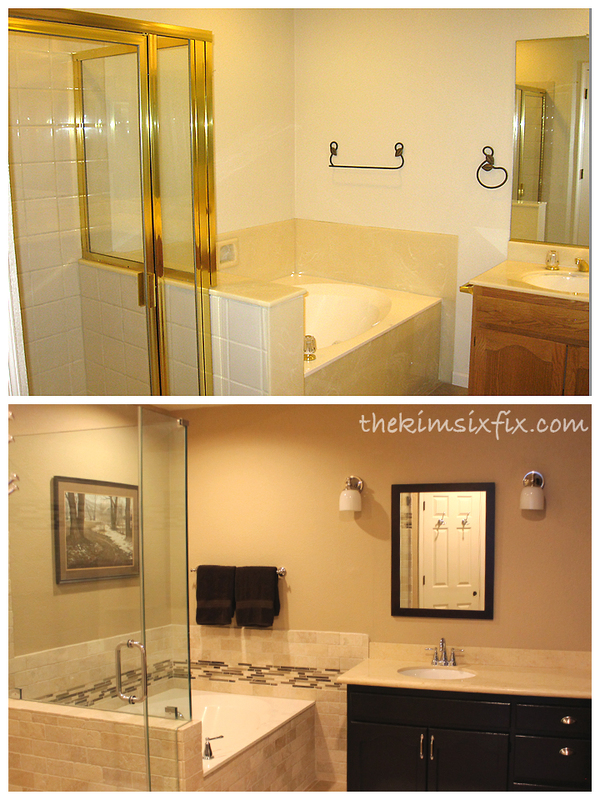 The biggest project in the room was definitely tearing out and replacing the shower. I framed the new shower, poured a new concrete pan, installed the liner, new walls, curb and tile. More than half my budget went to two big ticket items that I had professionally installed. The $1400 frameless door (and $1400 marble slab countertops ) are the only part of the remodel that I didn't do myself. 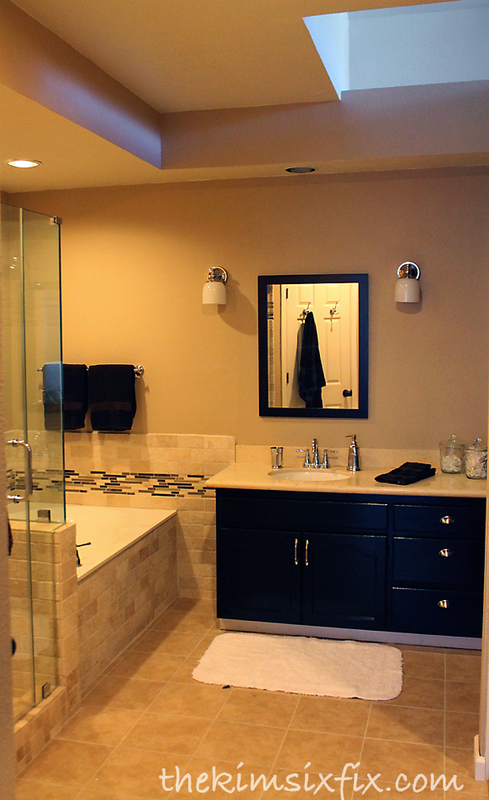 By leaving the shower and tub in their existing layout I didn't have any extensive plumbing to re-route. 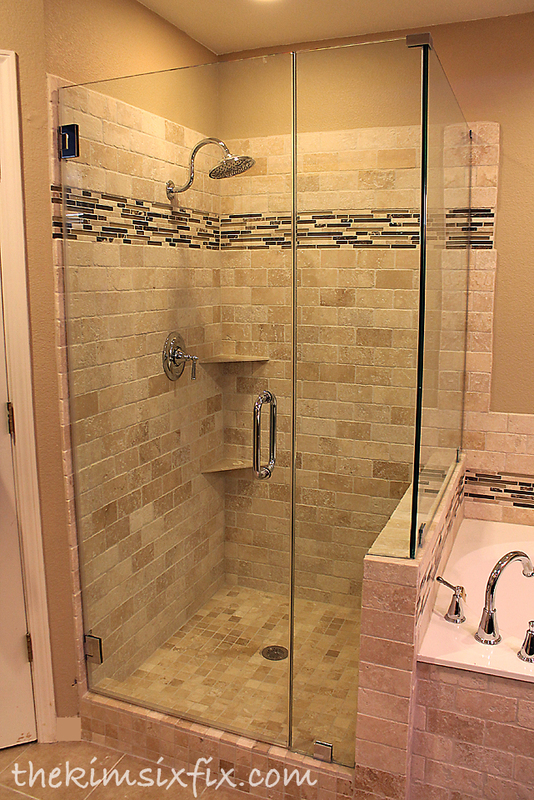 Both the shower and garden tub surround feature tumbled turkish travertine 2x3 inch tiles, with a glass pencil tile accent stripe. The floor is 2x2 honed travertine. 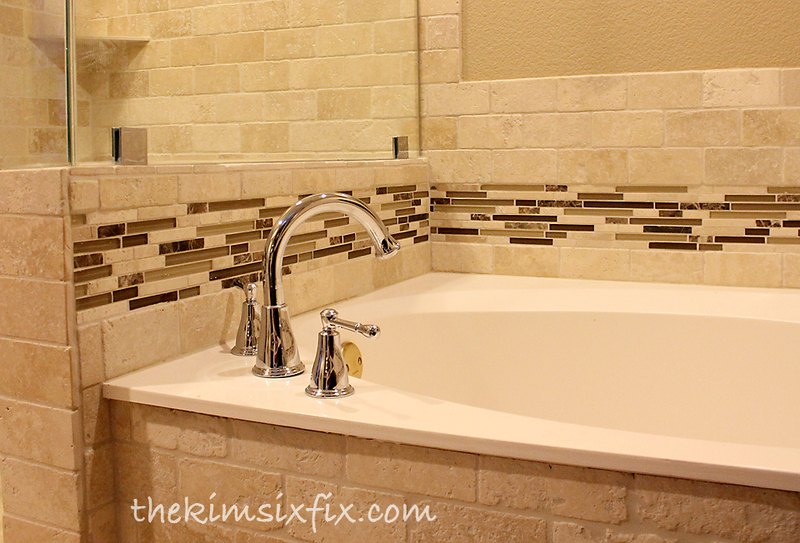 The grout is a light bone color to blend with the travertine. 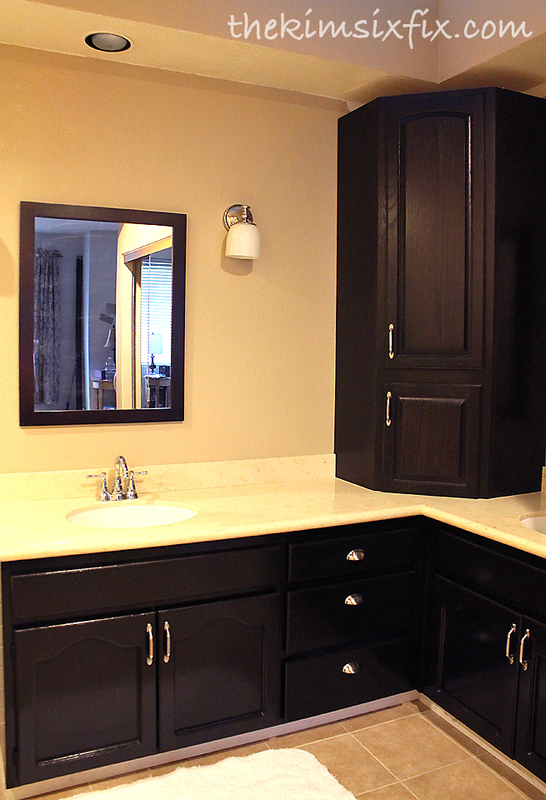 The new vanity no longer has the large fun-house plate glass mirrors. 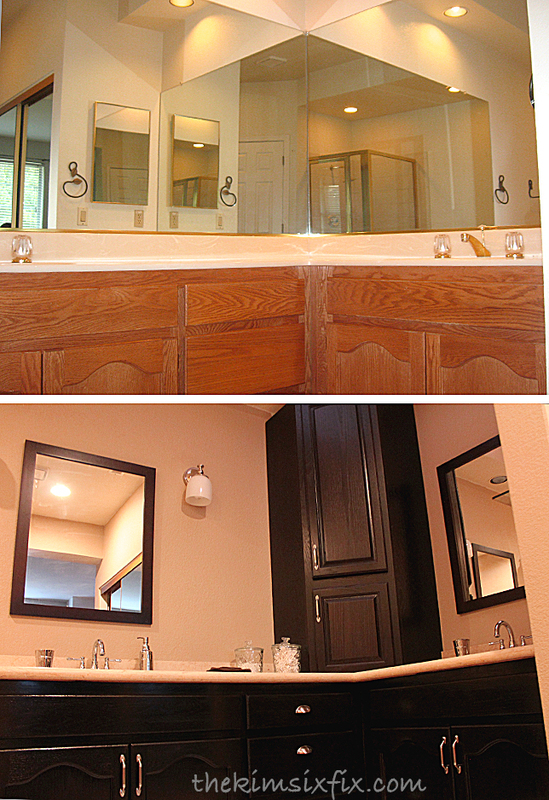 Instead I bought 2 framed mirrors (on clearance from Home Depot) and centered each above the new sinks. Just like my kitchen remodel (the original "80s to Awesome") I was stuck with my honey oak cabinetry since the quote just to replace them was nearly $4000. 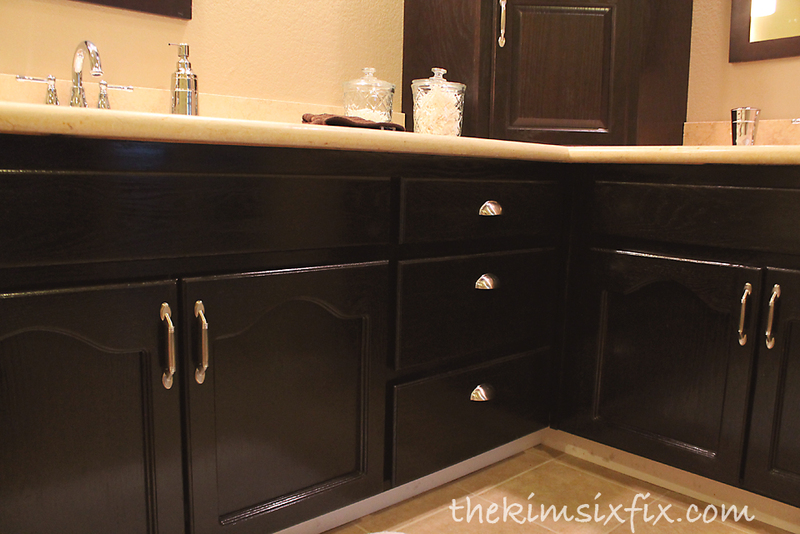 I decided instead of painting them like I did in my other bathroom, I would stain them like I did to my kitchen island. 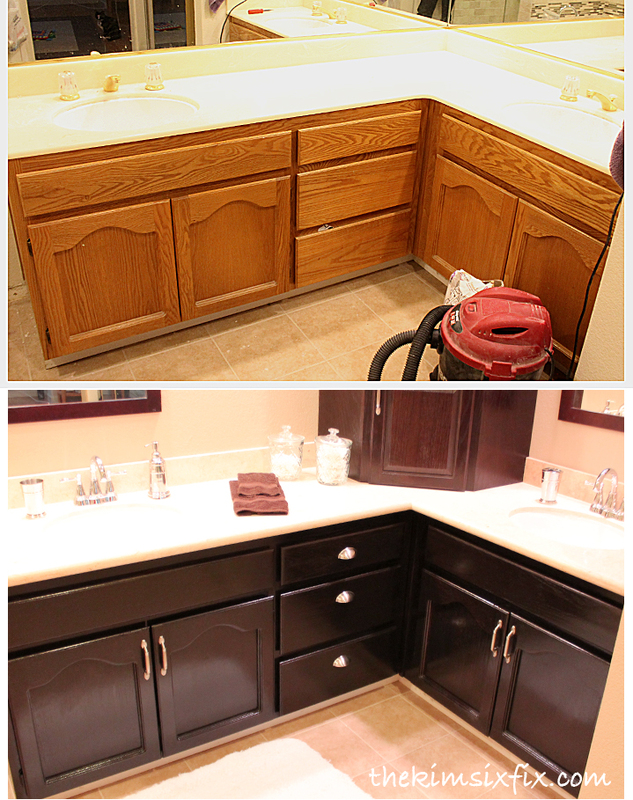 I purchased stain directly from Thomasville (the cabinet company) and was able to match my lowers to my new corner cabinet. 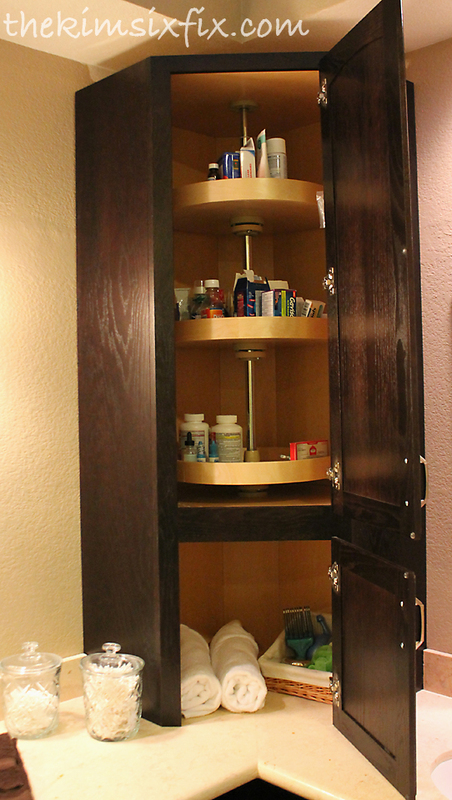 I installed the corner cabinet since I removed the ugly brass-trimmed medicine cabinet, I got the closet style I could find to the existing cabinetry. I still have to add crown molding to the top of the cabinet. The top cabinet houses a lazy susan which we use for all our medicine cabinet stuff, and the lower cabinet houses extra towels and my husband's electric razors, hairbrushes etc. I also installed new sconces and relocated the can lights in the soffet so they would be directly over the sinks. The chrome cabinet hardware was leftover from my mom's bathroom renovation so it cost me nothing. The chrome faucets are from Danze. The wall color is Mushroom Bisque from Behr and the ceilings are Frost from Kelly-Moore. If you go back to my inspiration post, you can see I pretty much nailed what I wanted, and stayed pretty darn close to my budget! I'm very very happy. Towel Bars, TP holder, glass shelf: Free! I started demo on October 9th and I finished the entire project on January 15th. It was a long project, but you have to take into account the holidays as well as having 2 kids underfoot and the fact I was pregnant and had morning sickness the entire time I was tiling. I probably could have completed it in less than 1/4 of that time if I had set my mind to it. I hope this inspires someone to tackle that project you have been putting off and only dreaming of! If I can do it, you can do it! This looks awesome!! Just started following you from Pinterest. And now I am tackling my kitchen soon with yours as my inspiration. Thank you for posting all your great ideas and remodels!!! It's absolutely stunning! Great work! Wow WOW, Kim! That was a BIG gigantic job and you totally tackled it. Amazing transformation! 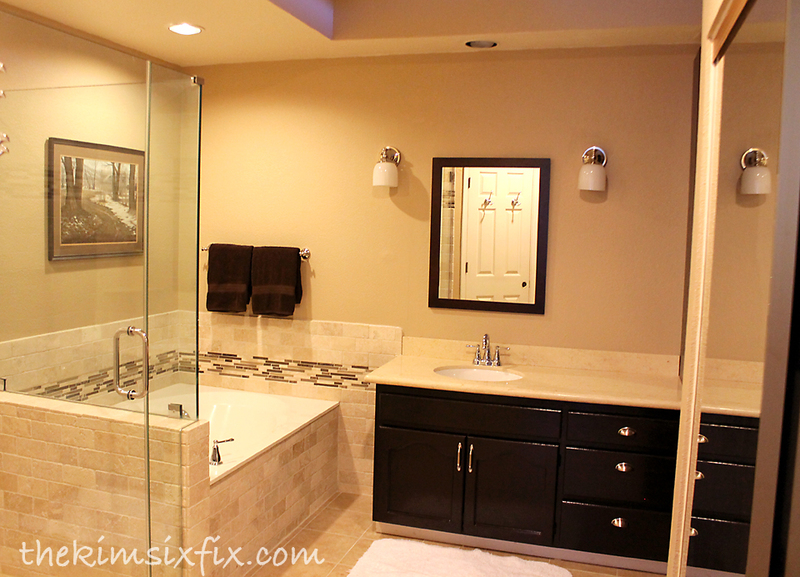 I don't know what I like the most, the shower with the sleek glass door or the "new" cabinets with such pretty counter! Tons of ideas and info that I have to remember for when I get to my bath, thanks! Awesome!! Still want to hire you to come do my new home. You are awesome girl!! So proud of you. You are inspiring us to finish our master bath , that's currently a concrete slab!!! I. Can't. Even. Take. You. This sentence? 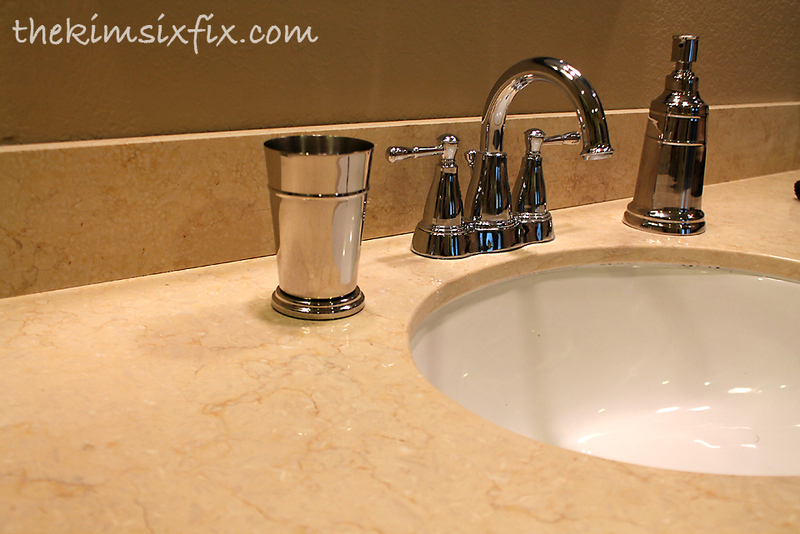 "I also installed new sconces and relocated the can lights in the soffet so they would be directly over the sinks." I don't even know what that means! Holy cow!!! This is fantastic and you did that yourself? girl...way to be!! I am in awe of you Kim! Where did you learn how to do all those construction things? Wow! I have been waiting for this day...to see the final post!! I cannot believe you did this all on your own and while you are pregnant!! Super MOM!!! I love all the detail on how an why you made your choices and how you completed each step along the way! I've been waiting for this day, too, Kim and now it's here. I can't belive it's actually been 6 months already. The bathroom is really stunning. And to now reveal to all of us that you were pregnant the entire time. I think you should include a side shot of yourself in the bathroom as well :). Love this! Great Job! 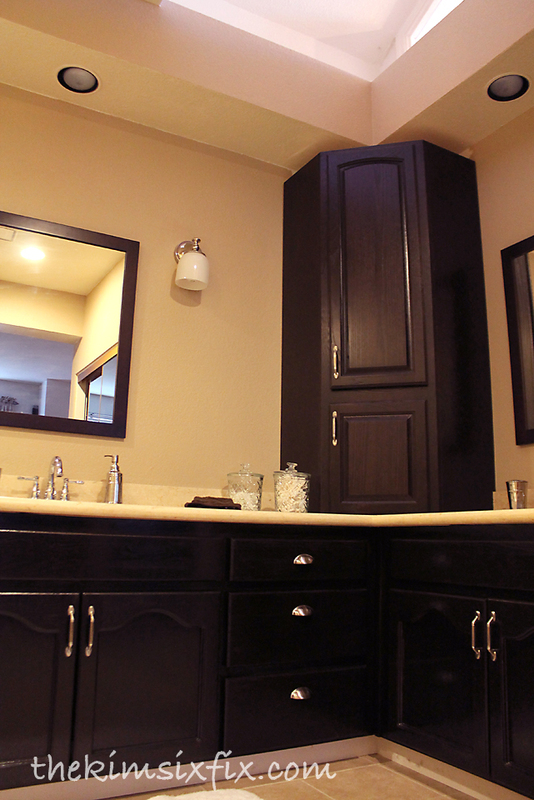 Wow, your bathroom is fabulous!! I love the shower. 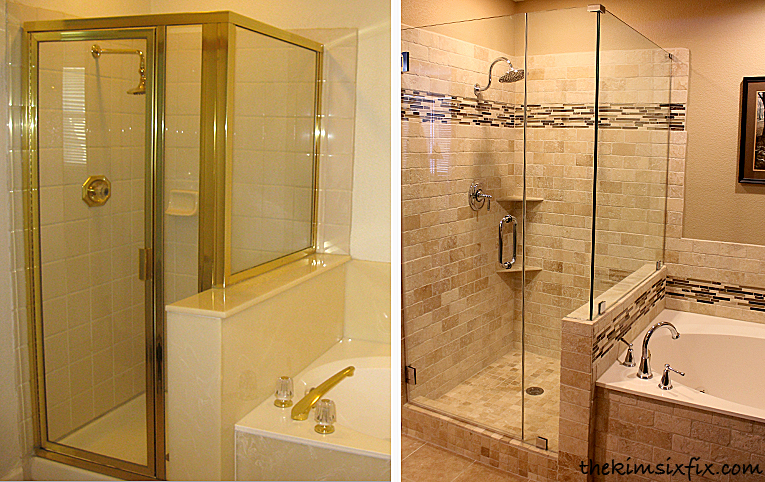 We have those gold shower doors at the moment, but that is on my major summer to-do list. :) Found your awesome blog at Embracing Change. Your newest follower. Looks great! You did a fabulous job and should be proud! Thanks for linking up and sharing this week! Beautiful! I've really enjoyed following along, so it's nice to see it finished. I have golden oak in my house, and we can't wait to paint it! We're going to sell, soon, though, so I keep thinking, "The new owners are going to look at my beautiful, newly-painted kitchen cabs (or fill in the blank) and say, 'Gosh, that's some ugly style,' and rip it all out!" Do you ever worry (or just feel a touch of sadness) about that happening in your home? Someone moving in and being, like, "Ew, dark wood!" 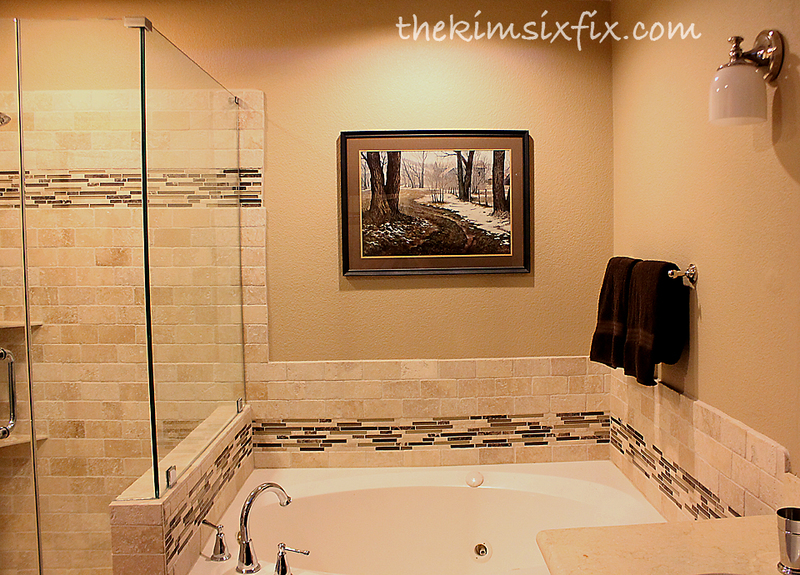 Kim, your master bath is INCREDIBLE! Your hard work, meticulous planning and tenaciousness is reflected in the end product. Awesome is an understatement and moreover, I'm thrilled that YOU have a retreat area that's beautiful, relaxing, and peaceful, especially now with the upcoming addition of your baby boy...Double Congratulations! And to think you did all the bathroom renovations while in the first trimester...Ohhh, Emmm, Geee! You are a poster child for the strength of women and especially moms everywhere. Thank you for your never-ending inspirations Kim! PS - I live in the Bay area too (Mountain House). and have followed your lead on several renos in my trac home - Grazi Mille! hi Kim! just recently found fyour blog and seeing all your hard work, i'm your GFC aaaaaaannnd, i nominated you forhte Versatile Blogger Award! YAHOO! your post and have fun! Is your tub white or bisque colored? I'm in the process of trying to decide what color I want....I hate decisions! Saw your beautiful bathroom on Debbiedoo's. Awesome! I pinned it too. that turned out so clean and chic! great job!! That gold shower gives me anxiety - lol. Love what you've done! Wow! You guys did FANTASTIC! Sharing this on FB! Once again an amazing achievement! I love the corner unit too - I have under counter cupboards, but this is a great idea for all our girly stuff! Thanks for showing us how doable it is! Amazing job, Kim! What a gorgeous transformation! I love your choice of materials. I'd be spending a lot of time in there! lol! I'm including a link back in this week's highlights. :) Thanks for sharing your hard work with us! WOW Kim - This is AMAZING, I can't believe the difference. It's gorgeous now :) Hope you are enjoying the heck out of it!! Wow! 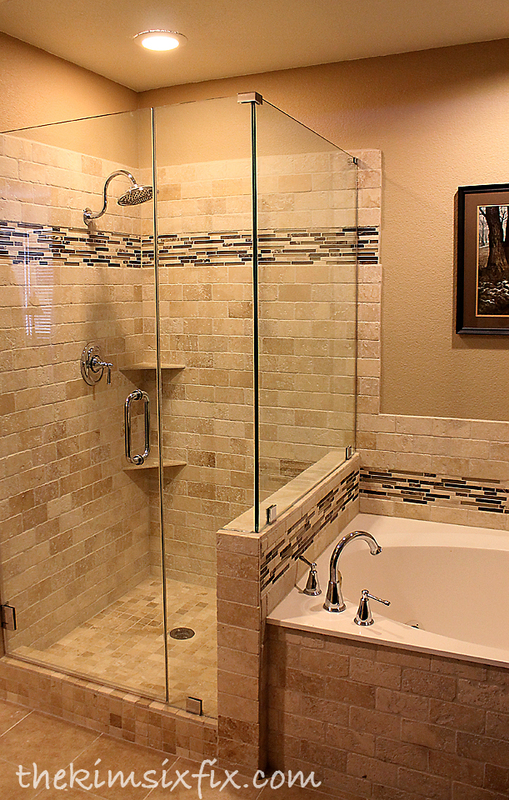 Your amazing and your master bath is gorgeous! This bathroom looks amazing. 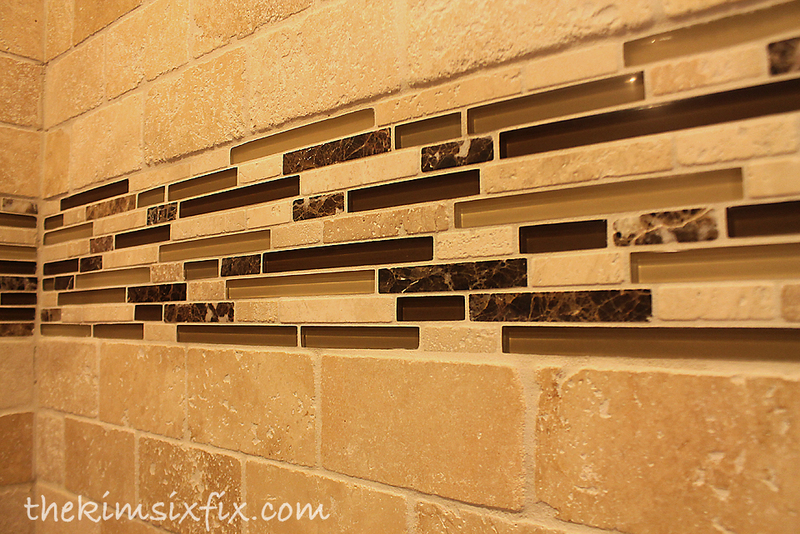 I really like the mosaic tile accent. The colors look great, and its a million times better! wow! your bathroom is beautiful! That was a lot of work. 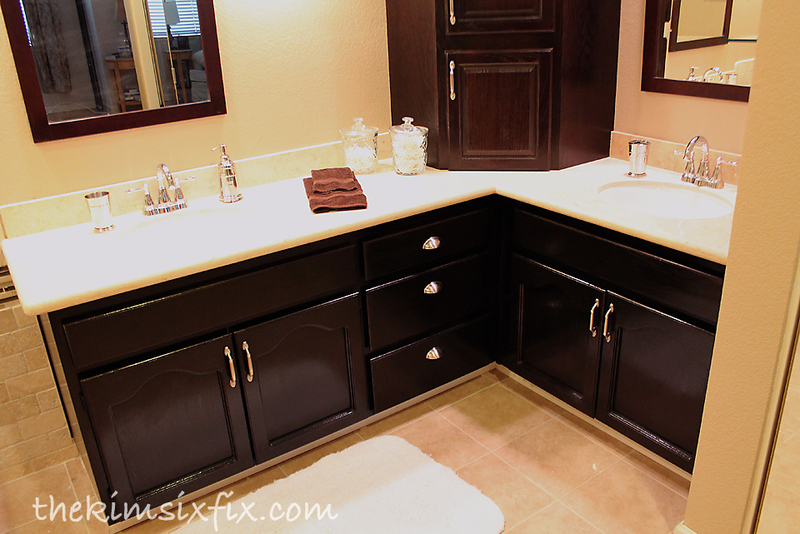 I'm wondering how you prepped the lower cabinets for the stain? Kim, whoa! Great makeover. Love the idea to add that corner cabinet! Smart move. Absolutely AMAZING!! I thought I was WonderWoman - no way. My hat is off!! OMG. Let me pick my jaw up off the floor. You did an amazing job! So impressive and while pregnant. You go girl. Such inspiration. Fabulous! 2 questions. what is that stain color (LOVE it) and any problems with the door swinging in too close to the shower head? Solutions? 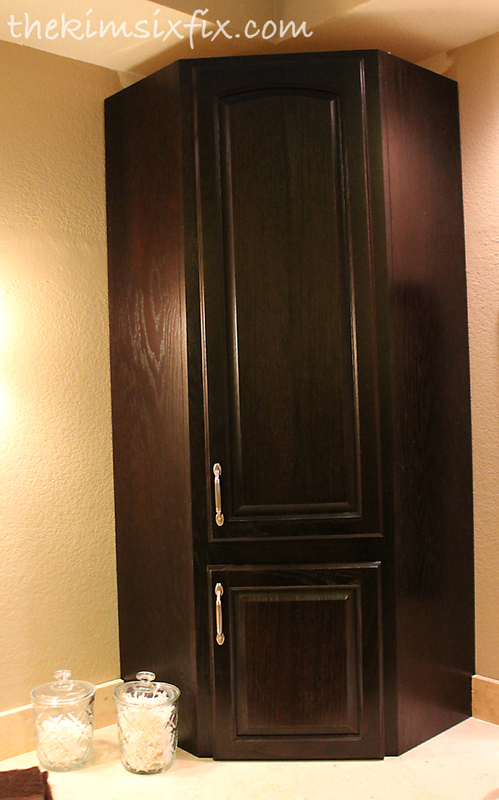 The color of the stain is "Chocolate" and the shower door swings outward.. so it doesn't have to clear anything. Hope that helps! Such a glorious space to retreat too! Job well done Kim! HELP! 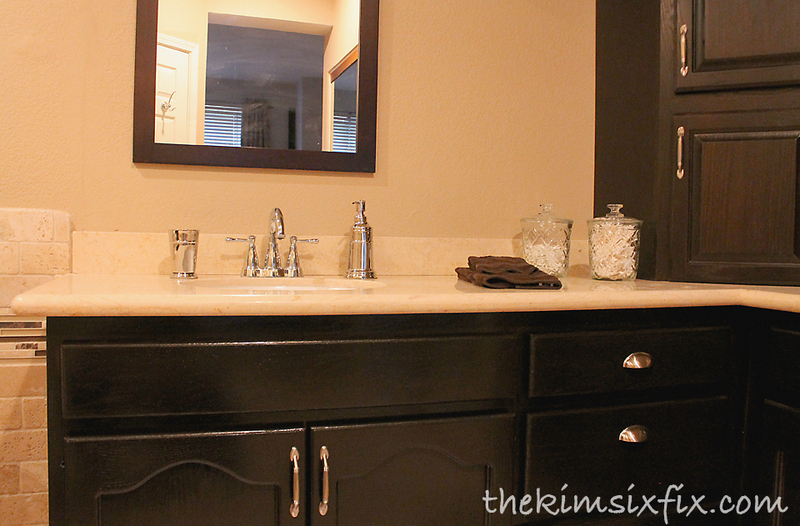 I have been looking for a countertop cabinet for the corner of my bathroom vanity for months. Where did you find yours? Thanks! Side note: It's been 9 months since we have a major leak in our master bathroom and we still haven't remodeled it. I'm overwhelmed and your bathroom has inspired me!!! Thank you so much!! !